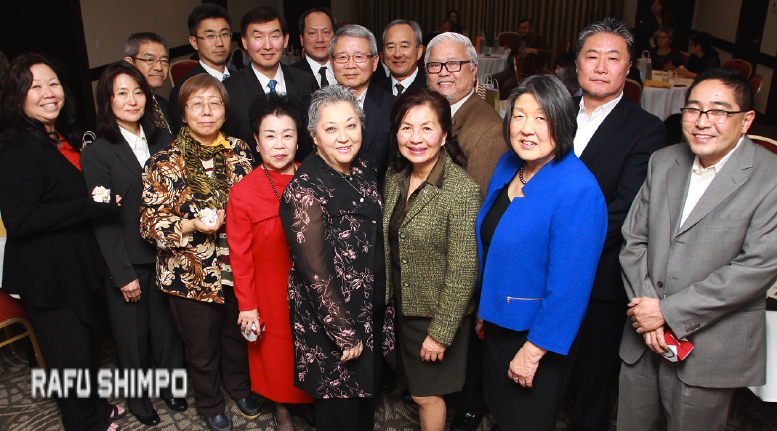 The Little Tokyo Business Association held its annual installation and shinnenkai party on Jan. 28 at the Miyako Hotel in Little Tokyo. LTBA members pictured are: (front row, from left) Nancy Takayama, Yuriko Shikai, Yoshiko Ueda, Tamako Henken, Ellen Endo, Sylvia Ena, Joanne Kumamoto, and Edwin Takahashi; (back row, from left) David Kudo, Keiji Kobayashi, Paul Abe, Andrew Lee, Haru Takehana, Doug Aihara, Mike Okamoto, and Hiroshi Yamauchi. 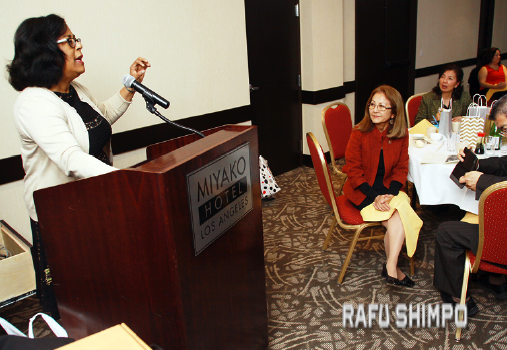 Below: Former Los Angeles City Councilmember Jan Perry, now general manager of the Los Angeles Economic and Workforce Development Department, addresses the gathering.